Let me begin by saying I totally get this. Let’s pretend you’ve got a five-pound fat loss goal, so you’re trying to watch what you eat. Like my client, you struggle most when it comes to curbing your intake of sweets. 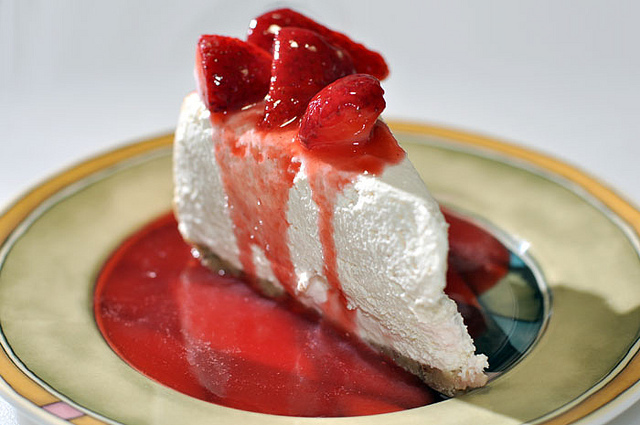 You have a special weakness for cheesecake. It’s Friday night, and you find yourself out to dinner with some friends. Your waiter clears the main course and offers you each a dessert menu. The house specialty is – you guessed it – New York style cheesecake. Each of your friends unapologetically orders a slice, and now it’s your turn. How do you feel? Um, frustrated, perhaps? Or in the words of my clients, a little deprived? Of course you do! Why do they get to eat the cheesecake when you don’t?! But now let me tell you two things that I told my client that will hopefully change your perspective and your relationship with food. First, if you really want the cheesecake, order it. Yes, that’s right. Your nutrition coach said order the stinkin’ cheesecake. But there’s a catch: limit yourself to just a few bites, and send the rest home with one of your friends. Or offer to share a slice with a friend and again just eat a few bites. If there is something that you truly love, you are entitled to enjoy it. You will have a much healthier relationship with food and be more successful at establishing sustainable eating habits. When most people think of diets, they think of something you go “on” and “off”: I’m on a diet. But a diet should be a way of life. If you truly love cheesecake and always deny yourself it, you are all but destined to fail. So that’s the first point. Nothing is completely off limits, though certain things should be consumed in small amounts. How small depends on you and your specific goals. The second point requires us to first figure out your PURPOSE for losing the five pounds. And your purpose is NOT something like, “so I can fit into the jeans I wore in college.” Your purpose is the REASON you want to fit into those jeans. It runs deeper. It’s emotional. Your purpose might be anything. For my client it’s about being happier and feeling more confident with her body. That’s the second point. When you start feeling deprived, flip your perspective: you are not depriving yourself of cheesecake. Overindulging in the cheesecake is depriving YOU of achieving your purpose, whether that be confidence, happiness, or something else.